With a digital style setting in a mechanical frame, the 4N-MVT01/42 easily stands out amongst the crowd. Created by the French designer Francois Quentin, the 4N brand first took shape back in 2009, but was not fully developed until 2011. Upon the 4N’s release it quickly became known as one of the world’s most unique designs. The 4N features a 12 hour display that changes due to Four rotating discs. Four discs indicate the hour, 5 discs indicate minutes and one disc indicates seconds. To make it easy on the eyes, a golden colored rectangle surrounds the time. This outlining is very useful because the other rotating numbers are visible on the watch and without a border showing the numbers you could easily confuse the time. The body of the watch is quite large, as are most unique luxury watches. However the 4N is designed in a rectangular case. Think of it as a small little widescreen TV on your wrist. Of course a TV that only shows you the time. 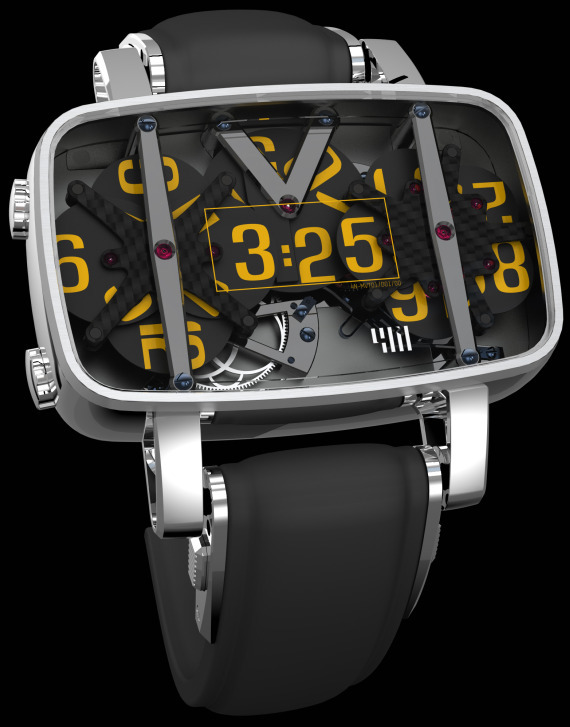 The case is constructed with aluminum and titanium alloys, making it a very sturdy watch. The movement employs a jump style mechanism to move the discs. With a constant force the mechanism reduces the amount of energy needed to run the watch. The power reserve for the 4N is estimated to be about 237 hours. There will only be 16 of these watches produced, available in either 18 carat white gold or platinum. The price has not yet been revealed but with its design and its grade, the 4N will definitely be one of those watches that will come with a golden price tag.